Writer Adriano Bolzoni was certainly no stranger to the genre, working on the script for one of the earliest Spaghetti Westerns, Sergio Corbucci's Minnesota Clay (1964), however his storyline here is nothing particularly exciting. A rather typical and always quite predictable 'hidden treasure map split into pieces' plot is combined with the usual 'self-proclaimed Mexican bandit leader' villain and a Django-esque leading character in a lawless Mexican border region setting that could be lifted from any number of the lesser genre titles. Fortunately the film has enough ideas and storyline to keep moving throughout its running time, even if it is somewhat on the slow paced side. Director Giuseppe Vari (credited as usual as Joseph Warren) had directed several Westerns, but like the storyline his work is nothing more than generic, giving the film a decent but uninspired feel. The low budget is evident in the very limited location shots, which seem to be largely shot in an Italian quarry rather than the Spanish deserts and never seem very authentic. Roberto Pregadio (L'ultimo killer (1967)) provides a decent but again largely forgettable soundtrack. Jugoslavian actor Dragomir Bojanic (credited as Anthony Ghidra) had appeared in Vari's earlier L'ultimo killer as a jaded retiring gunfighter (Django in many prints) - here he gets the leading role as his younger self and gives a solid performance although the script never gives him too much chance to act. A decent supporting cast including Claudio Undari (Condenados a vivir (1972)) as "General" Munguya helps to keep the film moving. 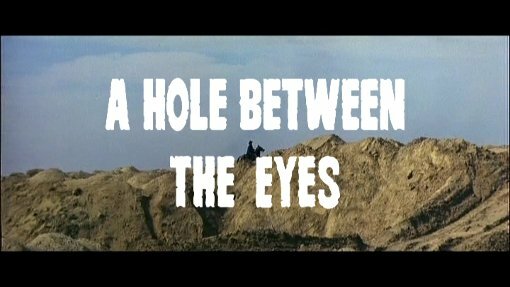 With a cookie-cutter storyline, uninspired direction and scoring and an obviously limited budget, A Hole Between the Eyes is a part of that great mass of Westsploitation films that emerged to capitalise on the success of the Leone and Corbucci productions. With some good acting and a script that manages to keep the pace going, the film certainly does not rank among the genre's worst titles but is only really of interest to Spaghetti Western fans who have worked through the many much better titles available. Who is it for? Just below mid-card ranking, this is one for genre fans only. Picture quality is strong with good colours and very good detail. Audio English mono - quite muffled in places and occasionally obscured by the music making some of the dialogue unclear. Trailer - as Ein Loch in der Stirn with a German voice-over. Widescreen, lesser quality than the film. An 23 image gallery of promotional images, lobby cards and video covers for this film under various international titles. As a video file with music and chapter stop scrollable. Additional features are included on the disc for the other included film Tequila Joe. Availability Only available as a double-feature with Tequila Joe. Other regions? Available from New Entertainment World Germany as 'Ein Loch in der Stirn' with a good looking anamorphic widescreen print - German audio only but English subtitles available. Extra features include the Italian Super-8 print and alternate opening and closing sequences. Cuts? Believed to be fully uncut. The opening title is English although there are no opening credits at all (there is a long riding sequence at the start which would be place for these, suggesting that the print used for the DVD was a title-free print). A very generic storyline and production but lifted by a good leading performance by Anthony Ghidra. Of interest. Picture quality is very impressive although the audio is a little muffled in places. The only DVD to include English audio options. All text in this review written by Timothy Young - 30th July 2010.